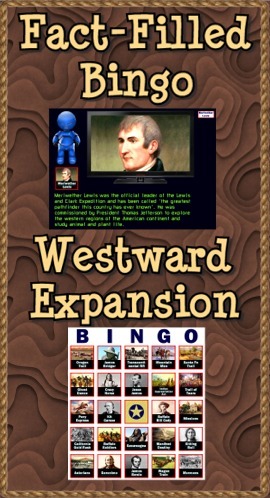 Are you looking for a way to add interest to your Westward Expansion unit? Do you need more activities for your learning stations? 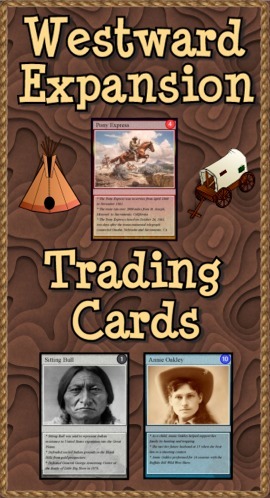 “Westward Expansion Trading Cards” is a set of 54 trading cards highlighting people, events, locations, treaties and ideas. Print & laminate the cards to create a standard set of playing cards. "Educational Trading Card Games" details 3 original learning games. "Creating Educational Trading Cards" shows teachers and students how to make their own cards. 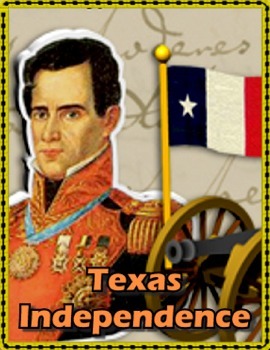 The Texas Independence Web site seeks to restore Washington-on-the-Brazos and the Convention of 1836 to their rightful place in Texas history, of equal if not greater importance than the epic battles of 1835-36. Through innovative and exciting Web-based technologies, the site brings the struggle, compromise, and sacrifice of the Convention of 1836 to life. It introduces the men who founded a new nation to a new generation of Texans. Fact-Filled Bingo is a computer program sure to bring excitement to your Westward Expansion unit. The talking robot calls out random western topics complete with pictures and interesting facts. 40 bingo cards are provided. Use the companion program Fact-Filled Slideshow and a SmartBoard/projector to highlight 48 different Old West topics. Again the talking robot does the narrating. As a bonus I’ve included the manual “Text-to-Speech” which teaches you how to make PowerPoints talk.